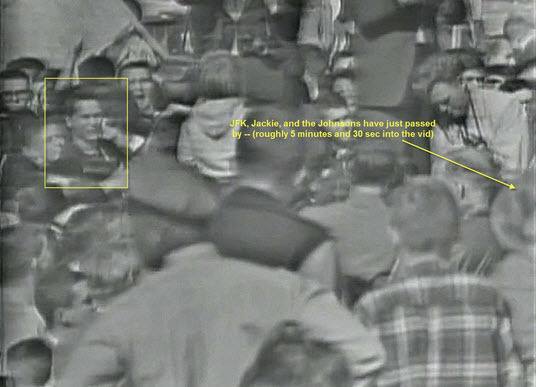 This web page is an attempt to connect some [personal] dots regarding events in Dallas during October, November, and December 1963. I have nothing to "prove" or to argue for - or against - regarding the assassination. have done their fact-finding with diligence and honesty. I have no other informed opinion than agreement with the conclusions of the Warren Commission. However, 50 years later, I still have some simmering emotional issues. instantly available to everyone through GOOGLE searches. I will provide several of those links on this page. less than half an hour before the President was murdered. and had skipped an 11 a.m. philosophy class to welcome the President to Dallas. "I hope Kennedy gets shot today." Astonished, I turned around and asked her if she realized she was talking about our President. "Yes, I do. 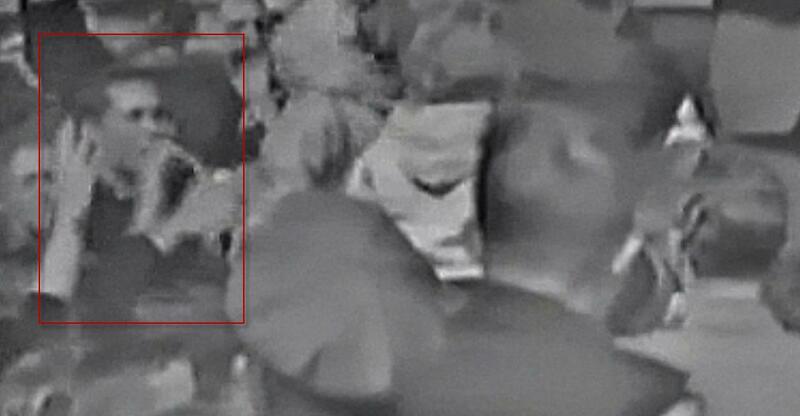 Someone has to kill him, and it might as well be here." I listened to him explain how the day's events had been "a textbook classical tragedy,"
and I told him how glad I was that I'd skipped his class. ambassador to the U.N. for the Kennedy administration. The very next day, Lee Harvey Oswald attended a meeting of the A.C.L.U. at Selecman Hall, in the Perkins School of Theology complex at S.M.U. 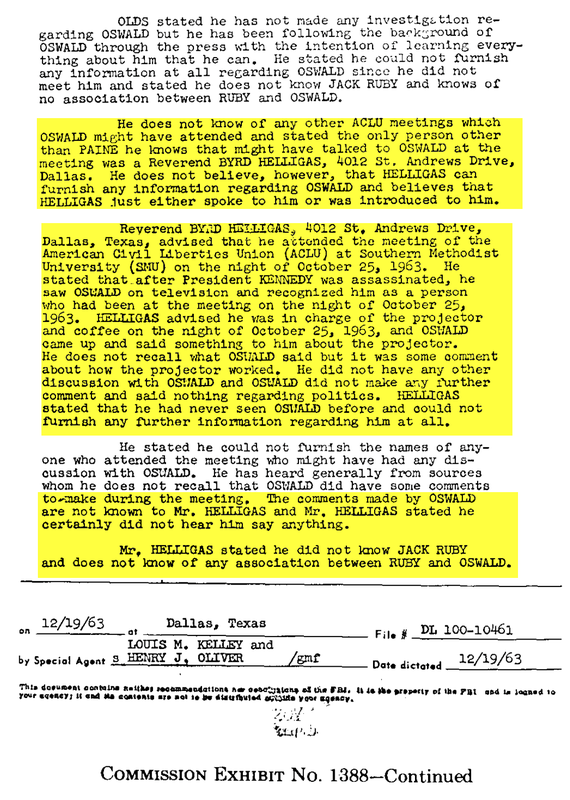 In that document (December 19), Byrd says that he "certainly did not hear [Oswald] say anything [at the ACLU meeting]." "erudite," "intellectual," and "calm" -- "having a good vocabulary" -- using "no dangling participles or split infinitives." sometime during the month between the ACLU meeting and the assassination. 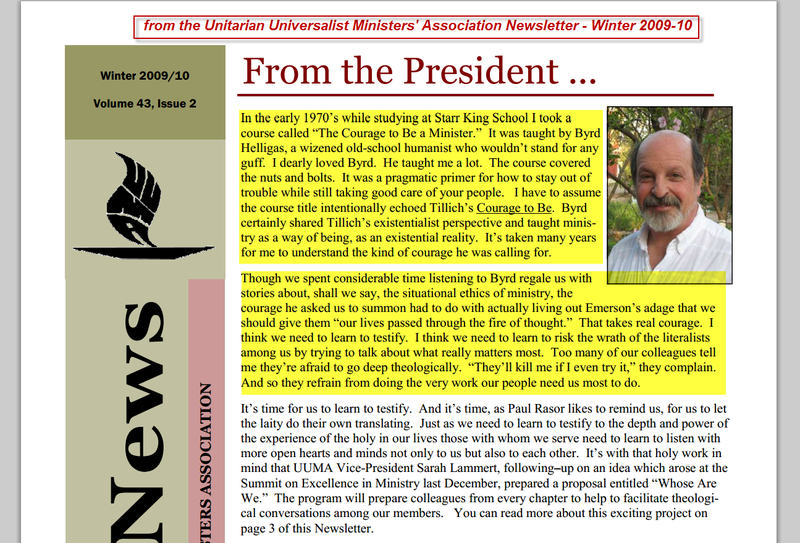 Byrd wanted me to apply to the Starr King School for the [Unitarian] Ministry in Berkeley. I distinctly remember sitting in Byrd's "Wizard Chair,"
to the left of which an enormous bumble bee dangled comically on a rubber band. seems, now, like a continental divide in my life. 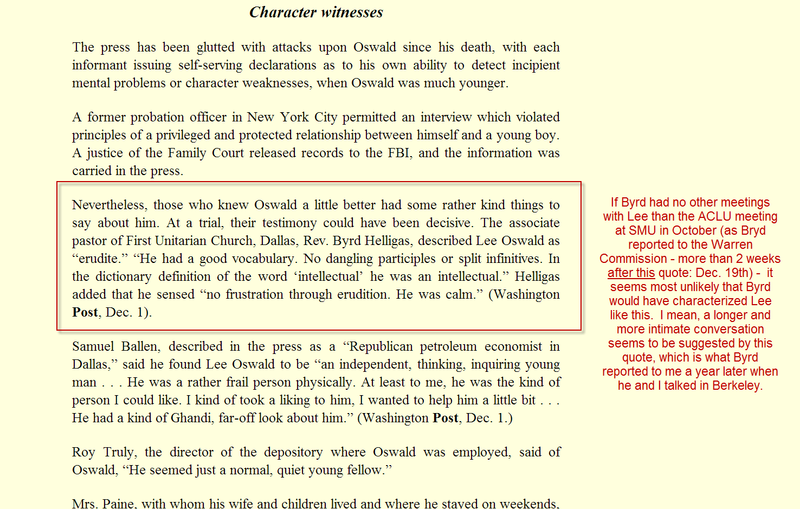 After the assassination, Byrd seemed un-typically anxious and preoccupied. "I can't imagine what Lee was thinking. . . I just can't imagine what he was even thinking!" 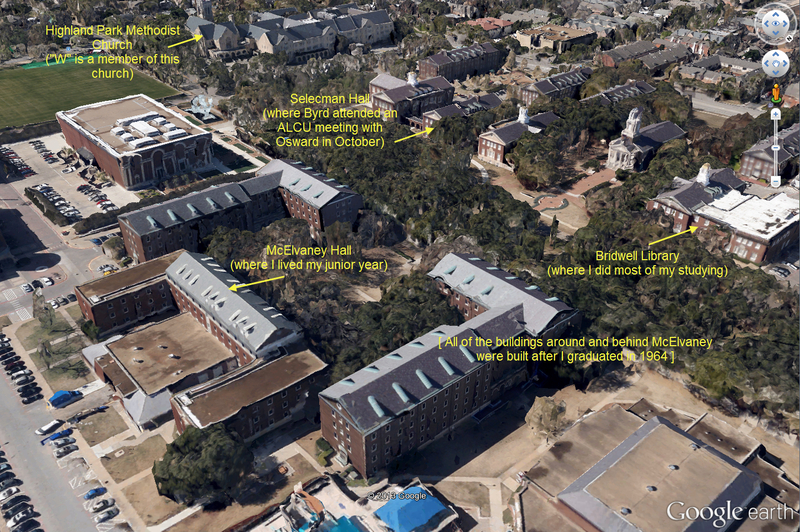 Then, everything about the assassination became unapproachable between us - in conversations between Byrd and me. I was a student at the Starr King School in Berkeley (fall of 1964). Byrd came to visit the seminary - and wanted to see me. By this time I'd heard rumors at Starr King about Byrd's involvement with "Lee," so I asked him about their "relationship." Byrd told me that Lee had "counseled" with him in his church office soon after the ACLU meeting, as had I. 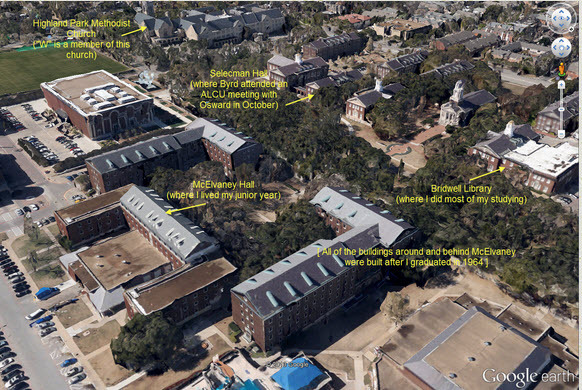 After meeting "Lee" at the projector, Byrd probably invited him to the UU Church. rather than at the ACLU meeting. 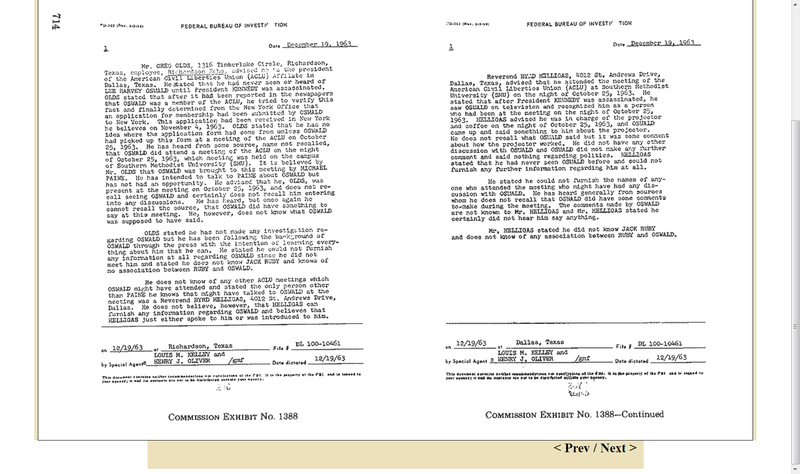 between Byrd and Lee in his Warren Commission testimony? that both Byrd Helligas and Greg Olds were trying to protect us. 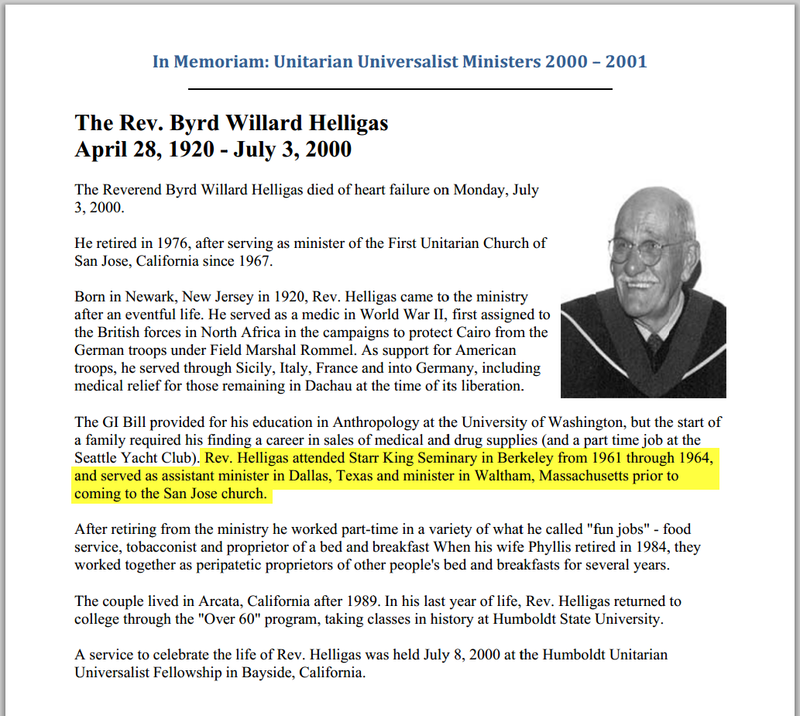 as well as those, like myself, who were involved with the Unitarian Church. If you've made it to this point on this page, I sincerely appreciate your compassionate attention. it also enabled some long-overdue healing of those same wounds. Please send along an email if you'd care to respond to anything I've written.